“Fuente Did It”: The Tale of Fuenteovejuna ~ Legend Stories for Kids No Reviews Posted. This is the true story of one of the earliest uprisings in the European feudal system - a peasant rebellion almost 500 years ago at a Spanish village called Fuente Ovejuna. In this story, the village is known as Fuente. "If we're to be married, let's not waste a second," urged Camila to her beloved fiancé, Lonzo. "Sooner is just fine," said Lonzo, stroking her hair. "But why the rush?" "You know as well as I do the Commander has his eye on me," said Camila. "His servants already tried to tempt me by giving me a new blouse, a necklace, and fine shoes, too. As if I could be bought! He's already done enough damage to the women here at Fuente before. He takes whatever woman he wants. When he's done with her, he throws her back to us like a chewed bone. And we all do nothing!" "No one will take you away from me," cried Lonzo, gripping her arm. "If only it were true!" said Camila. "Tell that to poor Olivia, or to Maria, or Inez!" "Or Hector's wife," Lonzo added, grimly. Camila sighed. "None of us here at our village Fuente is safe. No one knows what is going on here. Not even King Ferdinand or Queen Isabella." It so happened that Camila's father, Salvadore, was the mayor of Fuente. Later that day, Lonzo went to her father, the Mayor to ask his for permission to marry his daughter, and to marry her that very week. You probably know that today, young men usually don't need to ask permission from the parents of the young woman they wish to marry. Yet even today, many times young men still do this and parents are often glad to be asked. But this story happened nearly 500 years ago. And those were the days when parents had to say "yes" for a marriage to go ahead. Of this match Camila's father, the Mayor Salvadore, was glad to agree. Lonzo was a fine young man and he knew his daughter Camila was much in love with him. And so the wedding was quickly planned. Musicians wrote special songs and the village square was decorated with garlands of roses. On the wedding day, when the two lovers were about to exchange their vows, in marched the Commander with his servants. The Commander was returning triumphant from battle. 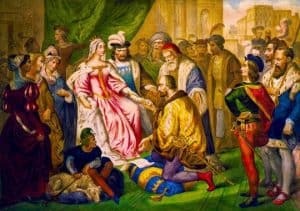 But he had not fought for his own king and queen of Spain, Ferdinard and Isabella, to whom he had pledged his loyalty. Instead, the Commander chose to fight for their enemy, King of Portugal. The sly Commander knew that if he could help the Portuguese king defeat King Ferdinand and Queen Isabela and throw them off the throne, the Commander would be rewarded with a large track of land to rule - perhaps even Castile, the largest region in Spain. It seemed that day was sooner than ever, since his forces had just captured an important border town for the Portuguese king. Fresh from his victory, the Commander knew how he wanted to celebrate. He looked around at the stunned wedding guests. Said the Commander in a smooth, steely voice, "Don't let me interrupt the ceremony. No one need be alarmed - unless they have done me any harm, or plan to." Mayor Salvadore frantically motioned to his daughter Camila and Lonzo to escape out the back door, but the door was locked. Then the Mayor turned to the Commander and said in an even voice, "Whatever you say, my lord. Won't you sit down? Did your soldiers defeat the enemy? How can we honor your victory?" "Stupid old fool!" snapped the Commander. "You know very well why I'm here." Facing Camila, he said with a twisted smile, "Minx, come here." "Sir!" said the mayor. "Today is my daughter's wedding day!" "What insolence!" yelled the Commander. "How dare you - or anyone else in this miserable village - have the nerve to act as if you were my equal!" To his servants, the Commander directed, "This wretch is Mayor no more. Take away his staff of office!" "You can have it!" said Salvadore, thrusting out his staff. A servant snatched the mayor's staff and handed it to the Commander. Furious, he broke the staff in two over the mayor's head. "And I shall do with it as I wish!" Salvadore saw that all was lost. He was no longer mayor, and spoke in a small voice. "Very well then. If that is what you wish. You are our master." "Father, no!" cried Camila, as the Commander's servants separated her from Lonzo, and dragged them both away. That day, Salvadore spread the word to the other men of Fuente to meet him at the village square that night. Gathered at the square as the moon rose, he said, "My daughter Camila is in such danger now I will surely go mad!" he moaned. "And Lonzo is locked in the tower." "Not so loud," urged his brother. "We must keep this meeting secret." "But we must do something!" The father paced back and forth. "There isn't a single person among us who hasn't been insulted by that savage lord. And now look what he has done!" "We should go to King Ferdinand and Queen Isabella," suggested one villager. "We can march to their castle with a petition of all our names." "We haven't time to gather names!" cried Salvadore. "And why would the King and Queen even believe us? They could still believe the Commander is loyal to them. Then they might wipe out our whole village for being disloyal and complaining to them about him." "We have no choice," said one farmer. "We must abandon the village. We'll carry our grain into the mountains and live in caves from now on." "Is that how we're going to live?" cried another. "Something must be done!" cried Salvadore. "What are we afraid of?" Suddenly Camila staggered in. Her face was cut and bruised, and her hair was rumpled. "Oh my daughter!" Salvadore rushed toward her. "How did you manage to escape?" "With no help from you!" Camila pulled back from her father. She stared at all the men with a crazed look. "The Commander dragged me away and not one of you tried to prevent it. You all just stood there. As if the Commander were a man with more arms and more legs than you have, or has more than human strength. He is only a man! - an ordinary, human, a small man, even. All we need are weapons. Give ME weapons - I'll avenge myself and all your wives. You cowards stand around and do nothing but talk, talk, talk. Keep sitting around and talking, for all I care. We women will kill these tyrants, even if we have to stone them ourselves!" She drew in her breath. "The Commander ordered Lonzo to be hung without trial. Next, he'll do the same to all of you. I can't say I'll miss you!" "Daughter," whispered Salvadore, "we don't deserve such vile talk. I'll go alone to face the Commander." "I'll go with you!" said another man. "Me, too!" said yet another. Calling "Death to the Tyrant!" the men charged off. Quickly Camila gathered the women. "Every man and boy is looking for weapons to fight with. But why leave the work to them? Aren't we women the one who have been outraged the most?" "Of course!" they all agreed. "But what can we do?" "We must attack his castle," she said. "Whatever comes of it, so be it!" As the men stormed the Commander's castle, an army of women came close behind. In short order, the Commander was killed, and all his servants taken prisoner. "What do we do now?" whispered one. "Surely we will die for what we have done!" said another with fear in his voice. "Listen to me," said Salvadore. "I speak in the interests of all the village. The king and queen will learn what happened here in Fuente. They are bound to send a judge to find out who is to blame. We must consider what we are going to say." "What is your advice?" said Lonzo, who had been freed in the storming of the Commander's castle. "We must all say, 'Fuente killed the Commander' and name no single person." "You mean, our entire village killed the Commander?" said one, confused. "Yes," said Salvadore. "For that is what happened. Our village of Fuente did it. Everyone, do you agree?" "Yes," said one and all. They would say, "Fuente did it." As predicted, King Ferdinand and Queen Isabella sent a judge to enact justice for the unexpected killing of the Commander and his men. But when the villagers were interrogated, even whipped, they did not say who killed the Commander. All they said, one and all, was, "Fuente did it." The judge had no choice but to return to court with this report. "I came to Fuente, your Majesties, as you ordered, and set about my investigations. I have not one word of proof. The whole village behaved in a most stubborn manner. Each and every one of them answered my questions as to who had killed the Commander by saying, ' Fuente did it.' The very name of the town! I can assure you, my lord, that I exercised all the vigor the law allows me, but neither threats, pain nor promises had any success. Therefore the only judgement I can recommend is that you order the entire village to be executed - or that you forgive all of them. They are all here to be questioned if you wish." King Ferdinand nodded. "Let them come in." And so all the men and women of Fuente crowded into the royal court. "Are these the murderers?" said Queen Isabella, scanning the cluster of farmers and peasants gathering nervously before her. Camila's father stepped forward. "Your Majesties, we are the people of Fuente who come to seek protection, and to serve you. We were oppressed and subjected by the Commander, as if we were not villagers but slaves who must suffer in silence. Now we appeal to you for mercy so that we may restore our dignity and honor. The cause of the Commander's death was his own tyranny. He stole our lands and produce, he ravished our women, and he showed us no mercy." "It's true, Your Majesties," said Lonzo. "You see this girl who has made me the most fortunate man in the world? On our wedding night he took her from me to his own house." Salvadore bowed low. "Your Majesties, we appeal to you for mercy. You are our King and Queen. We already put your coat of arms in our marketplace." "Well," said the King. "We have no written evidence against you, for no one has confessed. Your crime was indeed grave. But perhaps your sufferings justified it." "I agree," said Queen Isabella. "Such hardy villagers will make fine soldiers for our armies to fight the Moors." She opened her arms before the group. "We pardon you. Your village of Fuente is under our direct protection from now on. Be ready to be called upon to fight in service of the Spanish crown." And so the people of Fuente were forgiven by King Ferdinand and Queen Isabella. Overjoyed, they returned to their village to go on with their lives. Question 1: Do you think the people of Fuente Ovejuna were justified in rising up against the Commander and his men? Say YES or NO and explain why. This retelling of Lope de Vega's play script Fuente Ovejuna by Elaine L. Lindy, ©2007 is based upon a translation by Ruth Fainlight and Alan Sillitoe published by Dufour Editions, Inc. in 1969. This story is based upon an actual historical incident that took place in the village of Fuente Ovejuna in Castile in 1476. While under the command of the Order of Calatrava, a commander, Fernán Gómez de Guzmán, mistreated the villagers who later banded together and killed him. When a magistrate was sent by King Ferdinand II of Aragon arrived to investigate, even under the pain of torture, the villagers only responded by saying: "Fuente Ovejuna did it." The play Fuente Ovejuna was written by Spanish playwright Lope de Vega. First published in Madrid in 1619 as part of Docena Parte de las Comedias de Lope de Vega (Volume 12 of the Collected plays of Lope de Vega), the play is believed to have been written between 1612 and 1614. Lope de Vega was extremely prolific. He claimed to have written 1500 plays of which 450 survived (Shakespeare is credited with 38 plays).